Here's the deal, I'm a full time graduate student. I work 9-6 (on a good day), on weekdays & weekends. Despite the long hours & the fact that I never really stop thinking about my experiments when I get home, the most incompatible part of my work habits & online hobby is the dress code. Because I work in a research lab I have to abide by the strict dress code, I have to cover my legs, wear closed-toe flats, avoid loose layers that could catch fire/drag through chemicals & generally dress conservatively. Most of the outfits that I show you are the ones that I wear after 6, on the weekends & while traveling. I'm not trying to hide anything from you, but these are just the outfits I get to flex my fashion muscles more in, where I get to practice more stylistic freedom, and really explore my own aesthetic. I honestly want to try to incorporate more of my work appropriate attire here on the blog. I know I have an unconventional work environment, but I hope that you ladies like this new type of outfit posts. 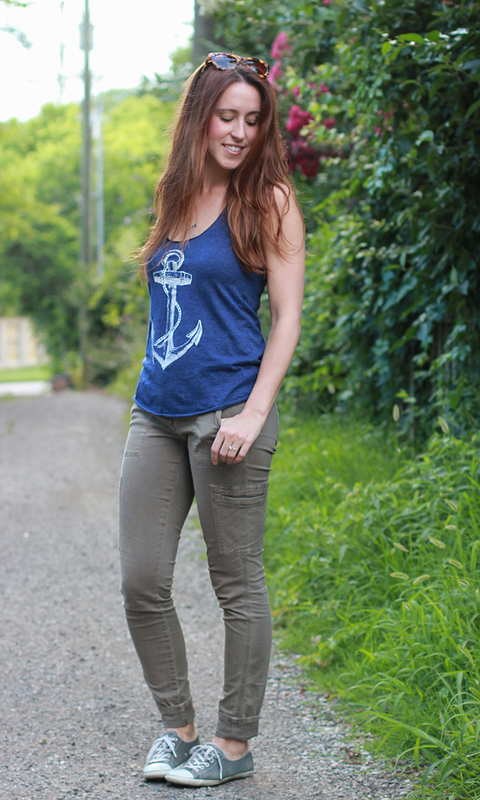 I must say, buttery soft tanks like this adorable anchor print skip n' whistle number make my pre-coffee weekday dressing so much easier! What dress code hoops do you have to jump through for your chosen profession? 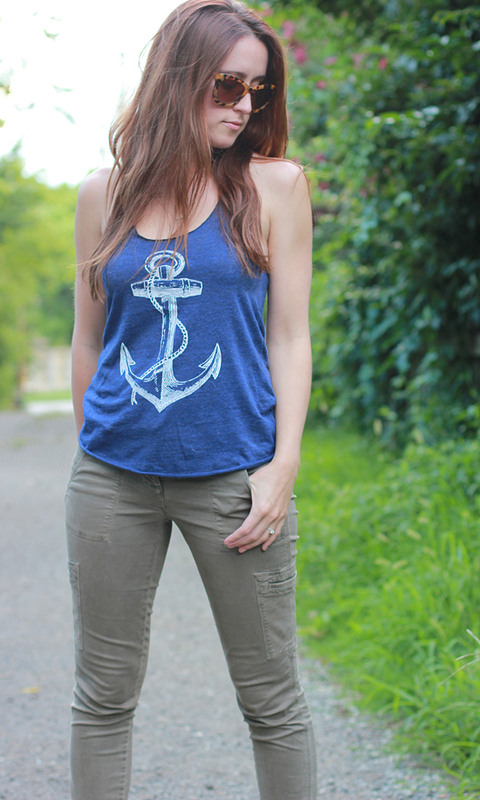 love your anchor top! this is a great laid back summer look! I love those cargo skinnies on you! My workplace is business casual, so I guess I get away with a little more than some in an office environment, but I do REALLY miss casual Fridays at my previous job! I think it's nice to see both styles. I will dress more conservatively wherever I end up. It will likely be in a human service organization, or possibly adult supervision. I just became a graduate student also so I will be taking night classes. My work clothes will definitely be soft and comfy with a little lycra ;). Comfort is a must for me. Beat this: For a whole year I worked in a pharmacy where I had to wear navy scrubs EVERY SINGLE DAY. I seriously considered not taking the job because of it, but that just seemed silly. On the plus side, I saved a lot of money on clothes that year because there's no point in buying stuff if you don't get to wear it! I also wore a lot of cute flats and fun necklaces to make the scrubs less boring! Oh man, it was bad though. My office is business casual and slightly more casual during the summer, so it's not as restrictive as your office. However, I do live in a conservative, rural area so my button-up denim top paired with my fun gold necklace last week . . . yeah, that got a couple of weird looks! I'm lucky that my office dress code pretty much encompasses anything I'd normally wear in life. I can't wait to see more of your work style! cute tank top! i'm lucky that my office is business casual but more on the casual side...so no jeans or sneakers but i can wear pretty much whatever i want besides that! One of my toughest work-wear challenges is the lack of dress code. I work in an agency environment that is incredibly casual, but since there are two of us in the office in our 20s and then everyone else is 40+, there are some hurdles to being treating like a full time professional and not a college intern. Balancing casual, professional, grown up and stylish is sometimes quite a feat! Love this, I definitely have to dress more conservatively for work........comfort is also key when working with a bunch of 10 year olds! The tank looks so cute on you...gotta love that anchor! I'm a SAHM so my issue is actually getting dressed. When Quinn was a baby I felt silly to "waste" a nice outfit if it was gonna get covered in spit up, but now I've fallen into a rut. I'm hoping that since I finally got my sewing machine back out I might start making some things and dressing up again. I'd love to see your work looks! My work/weekend wardrobe has a lot of overlap because I work in such a casual office. I love your anchor top! I can't wait to see more of what you actually wear to work. I usually blog more interesting outfits but since I'm a stay at home mom what I wear on days when I'm not shooting is a little more relaxed and casual. I always have trouble styling those days because nobody shows what they wear when they dress down! I work in an office with a business casual dress code, jeans are okay on Friday's, although I typically don't wear jeans. Dresses & skirts are dressier than what most others' in my office wear, but I still wear them quite often. Your outfit looks super comfy and cute. Love the tank. Cute outfit! I would love to see more of your work outfits! 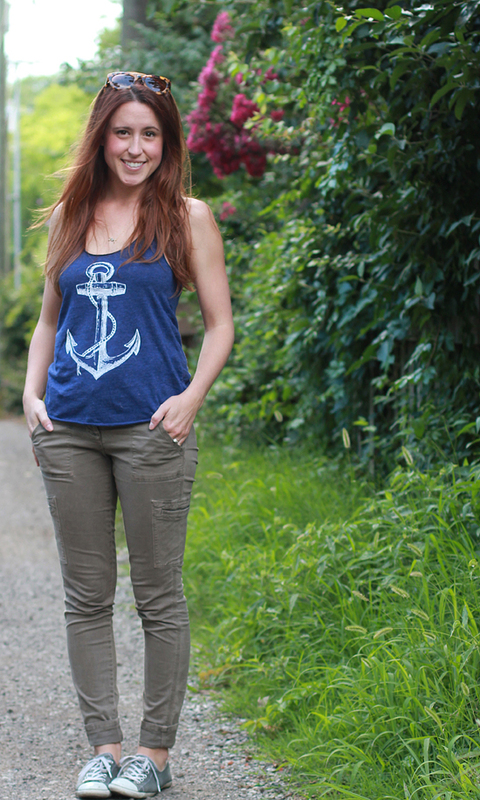 That anchor tank is adorable! Hey girl! Thanks for the heads up about the button swap, (I jumped right on that :) such a sweet deal! I'm glad you cleared that up because I have seriously thought several times, wait, she can wear that to work?! How awesome! Right now working a restaurant job requires me to wear closed-toed shoes/sleeves/comfy/able to get dirty clothes, so I can totally relate! Of course, this is not exactly a "profession", so I'm longing for those business casual days in the near future! I have pants from Gap really similar to this, can't wait to copy this look! Hope you're having a great start to the week! Boring maybe, but damn that would be easy and comfortable!! Scrubs are my favorite. Super cute tank! And most of my posts are evening/weekend wear but I'm getting better with my work outfits too. I have to dress business casual most of the time, which can be pretty boring but I'm doing my best to spice it up! Of course I'm a huge fan of the anchor - just adorable! Thank you so much for sharing this! It's so sad to see all these fashionable bloggers and wonder how they can always dress so cute, either casually or more dressed up. I have a dress code similar to yours. Closed-toe flat shoes, pants or a knee-length or longer skirt, and work polo shirt. The posts I do on the blog are usually what I wear for the few hours before work or on days off. I try to vary my outfits by wearing my maxi skirts, two knee-length skirts, or tying my shirts over my longer dresses. It's a very casual workplace but I wish I could dress up!! I feel so frumpy going to work, even if I put in extra effort. It's refreshing to see I'm not the only one! Love that outfit! Relaxed casual chic, very Swedish! Plus I often think that a dress code can let you be more creative to get a touch of your personality into limitations. Nice! I hate dressing for work! Actually, not really, but my work is FREEZING all summer long and DC is sososo hot. 4 years after I moved, I still can't figure out how to wear something to be comfortable both inside and out during the summer. i have to say that i've lucked out and my last few jobs i've been able to wear pretty much whatever i want to work.... LOVE that tank! Ugh, how do you not die from the heat? I can barely make it in shorts! I love seeing work outfits! I'd love to see more on your blog! This outfit is one of my favorites of yours - so cute. Those olive skinnies are absolutely adorable!! Love Love Love the tank! Super cute. dude you know I like seeing more of those outfits! lab requirements are a beast only a few blogging ladies know a lot about, so I'm excited to hear more about it from you!